​ Maryland manages 41 species of coastal sharks, including spiny dogfish. Some sharks are found​ strictly in coastal waters, and others, like the bull shark, are also found in the main stem and some rivers of the Chesapeake Bay. Shark management is a joint effort of the State of Maryland, Atlantic States Marine Fisheries Commission, National Oceanic and Atmospheric Administration, and the International Commission for the Conservation of Atlantic Tunas. The Atlantic States Marine Fisheries Commission and State of Maryland manage coastal shark fisheries in state waters (out to three miles) while the National Oceanic and Atmospheric Administration manages shark fisheries in federal waters (3-200 miles offshore). The National Oceanic and Atmospheric Administration implemented the Consolidated Highly Migratory Species Fisheries Management Plan which includes sharks of the Atlantic Ocean to help replenish and protect shark species. Subsequently, the Atlantic States Marine Fisheries Commission adopted an Interstate Fishery Management Plan for Atlantic Coastal Sharks. The Atlantic States Marine Fisheries Commission Fisheries Management Plan manages forty species of sharks with a goal of being as consistent as possible with the federal Consolidated Highly Migratory Species Fisheries Management Plan (NOAA 2006). Additionally, spiny dogfish are also managed at the State and federal level under separate management plans. The International Commission for the Conservation of Atlantic Tunas has prioritized the biological study and assessment of the major sharks of the epipelagic system as these species are more susceptible to being caught as by-catch by oceanic fleets targeting tuna and tuna-like species. Among these shark species there are some of special prevalence and with an extensive geographical distribution within the oceanic-epipelagic ecosystem, such as the blue shark and shortfin mako shark, and others with less or even limited prevalence, such as portbeagle, hammerhead sharks, thresher sharks, and white sharks. More information about sharks and other highly migratory species is available in the Maryland Guide to Fishing and Crabbing​. Most of the commercial shark fishery landings are comprised of smooth dogfish caught using gillnets. Fishing for sharks occurs off the beaches and from boats fishing in the Atlantic Ocean and Coastal Bays. Most of the sharks are released. Maximum survivability is heavily stressed and steps can be taken to ensure anglers are being careful with the sharks they catch. Practicing safe dehooking procedures and minimizing fight time with the appropriate equipment will ensure that the animal is released back into the water safely. Visit the NOAA Apex Predator webpage and read the Careful Catch Brochure​ for more details on these recommendations. In addition, the Coastal Fisheries Program worked with Ocean City charter boat captain and founder of the Ocean City Shark Tournament, Mark Sampson, on a shark hook study. To learn more about the results of the hook study, visit our Publications page. In Maryland, recreational anglers are required to report all landed sharks, with the exception of spiny dogfish, to the State via the Catch Card and Tagging Program. 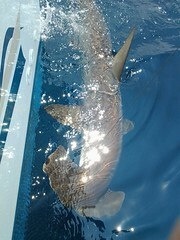 Coastal: smooth dogfish, spiny dogfish, sandbar, dusky, Atlantic sharpnose, scalloped hammerhead, and sand tiger sharks. Pelagic: shortfin mako, common thresher, and blue sharks. For more information on reducing risk please visit the Florida Museum of Natural History website.